« mouse mouse rockstar hats! 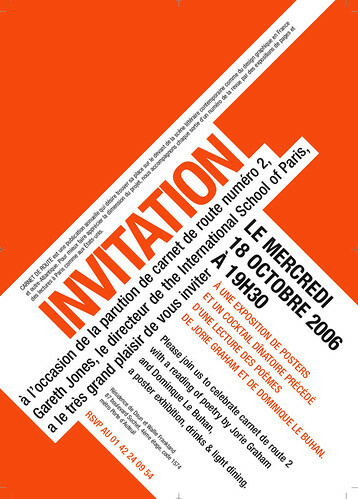 Click here for the carnet de route homepage. the tongue is a boat in our head. Click here for the 26 homepage (which hasn’t yet been updated to include information about issue E). You can purchase 26 via Small Press Distribution, one of the greatest literary resources in the universe. And while we’re talking about great literary journals, why not check out the Xantippe site? Xantippe is edited by Kristen Hanlon and always includes a wealth of great poetry and writing. The second and third issues feature covers shot by myself, and past issues have included poetry by D. A. Powell, Mary Szybist, Kimberly Johnson, Rusty Morrison, John Isles, Arielle Greenberg, Molly Lou Freeman, and wild others. While I’m running off at the mouth of self-promotion, why not put in plug for my two books as well? 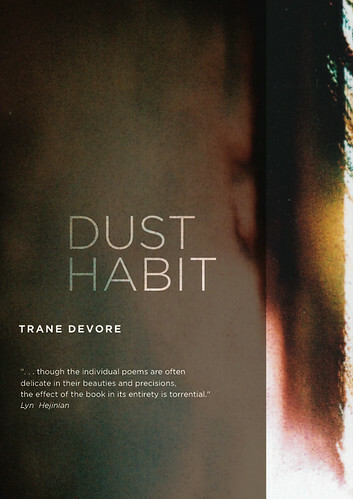 Dust Habit, published in 2005 by Avec Books, is my most recent collection of poetry and includes fantastic graphic work by Tessa Lee, who designed the cover, as well as the announcement card (pictured above). My first book, series/mnemonic, features brilliant cover design by Colleen Barclay, as well as an author photo by the prolific Tessa Lee (who works for Public, a design studio in San Francisco). You can purchase both of these books from Amazon (including Amazon.co.jp), but why not purchase via Small Press Distribution instead? Or even better, have your local bookstore order a few copies. Thanks Laurel — I love Tessa’s work too. Previous: mouse mouse rockstar hats!